(Ottawa, Ont.) 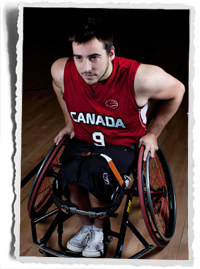 The Canadian Men’s U23 Wheelchair Basketball Team will play a series of four friendly matches against Great Britain September 1 to September 4, 2013 when they stage for the upcoming World Junior Championship in Stoke Mandeville, England. The exhibition games serve as Canada’s final opportunity to train before travelling to Adana, Turkey for the 2013 World Junior Wheelchair Basketball Championship taking place September 7-14. The World Junior Championship is held every four years and Canada will be one of twelve countries competing for the world title with the added incentive of potentially becoming the only team in history to win the tournament three times. The inaugural Junior World Championship was held in Toronto in 1997 and Canada went on to win the first two tournaments (1997 and 2001). The USA, which won the tournament in 2005 and 2009, will not be participating in 2013. “Every player and staff member on this team is extremely proud to be Canadian. We are proud of Canada’s history in wheelchair basketball, and of past successes at this tournament, but this is an entirely new roster than the guys that won in 2001, so the real opportunity is for the current players to create their own history and start a new legacy,” said Team Canada head coach Steve Bialowas. Canada will compete against Great Britain, Germany, Iran, Mexico, and South Africa in Pool A, while Australia, Italy, Japan, Sweden, Venezuela, and host Turkey will represent Pool B with the gold medal final set for September 14th. “All the countries are in a similar situation where there is not a lot of opportunity to scout the other teams. We know that we need to compete at a consistently high level in order to be successful,” explained Bialowas. The Canadian athletes and coaches began training for the World Junior Championship over two years ago. They earned a berth into the World Championship in March 2013 by winning the Americas Zone qualifier, defeating host Mexico 74-67 in the final game. “I am very proud and appreciative of the way the wheelchair basketball community across the country has rallied to support this team. Annie Goodchild, Allain Gamache, Ross Norton, Kevin Poulin, Mike Frogley, and Jerry Tonello are just a few of the countless people who have volunteered their time and shared their expertise to help develop these junior athletes in order to get them prepared for this championship and ultimately contribute to the goal of being part of the top wheelchair basketball program in the world,” said Bialowas. The 2013 Canadian roster includes three returning players from the team that placed eighth at the last Junior Men’s World Championship in 2009. Team Canada recently wrapped up centralization camp at the University of Toronto July 28 – August 14 and is set to depart for Stoke Mandeville on August 30th. They will arrive in Adana, Turkey September 5th, and return to Canada September 15th. The Canadian Junior Men’s Wheelchair Basketball Team consists of the top male athletes under 23-years-of-age from across the Country. They are assembled with the ultimate goal of competing in, and winning the U23 Men’s World Championships, which are held every four years. Canada hosted the inaugural tournament in 1997 and won back-to-back World Championships in 1997 and 2001.